The single-action .45 Colt revolvers and their detachable stocks were real. One of the more famous stories about detachable shoulder stocks occurs in 1876, when Western dime novelist Ned Buntline presented special Colt revolvers to five of the West's premier lawmen, including Wyatt Earp. The Colts, known today as "Buntline Specials," came with metal shoulder stocks and extra-long barrels and were meant to thank Earp, then a deputy marshal in Dodge City, Kansas, for letting Buntline interview him. One small problem? Never happened. The original shoulder stock for a Buntline Special adds $40,000 to the value of the gun. But be warned: Copies are common. "At no time during the period in which his interview was alleged to have taken place was Buntline even near Dodge City," says Kelly Williams, associate curator at the Frazier Firearms Museum in Louisville, Kentucky. The single-action .45 Colt revolvers and their detachable stocks were real enough, though probably fewer than 30 of them were ever produced, their barrels between 12 and 16 inches long. The 29th Edition Blue Book of Gun Values lists a Buntline Special with 90 percent of the original finish as worth $135,000; add on another $40,000 for one with the original shoulder stock. The Frazier is home to such a Buntline, with 16-inch barrel and an all-metal stock made of nickel-plated brass. "The detachable, skeletal frame stock converts this heavy-barreled pistol into a carbine but does little to improve the weapon's accuracy," Williams notes. Detachable shoulder stocks arrived on the American shooting scene circa 1850. According to Richard Rattenbury, curator of history at the National Cowboy Museum, "Colt introduced full wooden stocks, with three variant yoke attachments, with the Dragoon model, followed by the 1851 Navy and 1860 Army." Yet the shoulder stocks never gained a wide following in military or civilian circles. Today, some 19th century shoulder stocks are actually worth as much as the handguns they were built to accessorize. 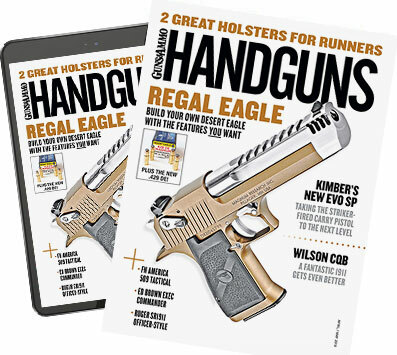 Dan Shideler, editor of Standard Catalog of Firearms, recommends a professional verification of authenticity before buying one. "All of these stocks have been copied, with some of the most ingenious aging techniques imaginable, so caveat emptor certainly applies," he warns.